Streetz is a new action/thriller that focuses on the gritty underbelly of the urban streets being published by Advent Comics. A wave of deaths after the release of a new designer street drug targeting the urban community is the catalyst that kicks off the story. But we will quickly find out that things are not what they appear as a sinister plot is revealed that will put these heroes to the ultimate test. The first issue is currently being funded through a Kickstarter that ends on January 4th. Tony Kittrell, the Creator/Writer of the series states “this is a proposed, four issue mini-series which brings together all of the diverse heroes in the Advent Comics Universe and shines a spotlight on the Street-level characters for the first time”. The story begins with the mysterious death of an inner city hero and puts into motion the gathering of the Greatest Heroes of All to solve the crime! Titan the Ultra Man! Nia X! Hannibal! Nimrod the Hunter! The Liberators and many others will be introduced! In addition to superheroics, the story will incorporate real issues facing inner cities into the mix. Knowing past projects from this writer and Advent, this is liable to be one EXPLOSIVE tale! Take a look at the campaign and support the team by making a pledge. One of Maryland’s premiere Indie Comic Publishers, Advent Comics will be on hand at this year’s Baltimore Comic-Con with their latest comic releases, including Greg LaRocques‘s The Regulators #1 and Project: Homeland #0 with the main story produced by Bart Sears. 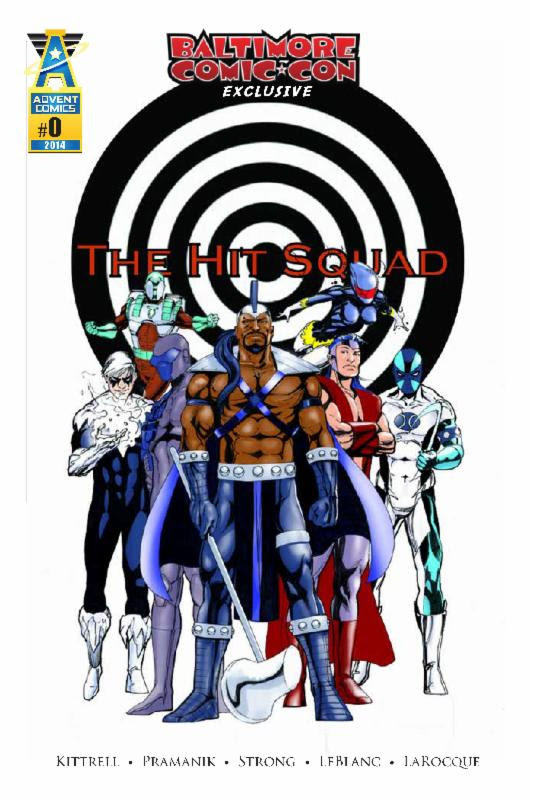 Also, they will have an exclusive, available only to attendees of this show – The Hit Squad #0! The Status Quo has been…Shattered!! As Advent Comics prepares for this year’s show, we are proud to present our first ever Baltimore Comic-Con exclusive – The Hit Squad #0. This 24 page, MATURE READERS title features the Advent Universe’s deadliest assassins in their very own one-shot. This hard-hitting release features “Original Sin” by Tony Kittrell, Dev Pramanik, Chris Strong, and Chris LeBlanc, and back-up tale “Murderous Intent” by Tony Kittrell, Ronaldo Florendo, Rachel LaChance and Oren Kramek. Special cover by comics superstar Greg LaRocque. Advent Comics invites you to their booth #2206 to get your books signed by head writer Tony Kittrell and to pick up the latest info on upcoming projects like the epic Cosmos Maxi-Series that will have the industry buzzing! The staff at Advent Comics is looking forward to meeting all of the fans at the show!